I reserve the right to have more thoughts later, but this an e-mail I sent a friend tonight that I’m posting here as a starter. It was, from a spectator standpoint, not the best launch I’ve been to; definitely in the lower half. It really looked like it wasn’t going to happen today because of weather. The weather ended up complying, but being very cloudy, so she disappeared pretty quickly after launch. In fact, she was out of sight behind clouds long before the sound reached us from the pad. That didnt matter. At all. I was there. I was there. I can’t tell you what that means. I can’t tell you how grateful I am for that. I was there, in person, for the end, for the last launch. I’ve followed the program my entire life. The shuttle was the first American spacecraft to fly in my life, and I was five when I watched the first launch on TV with my dad. 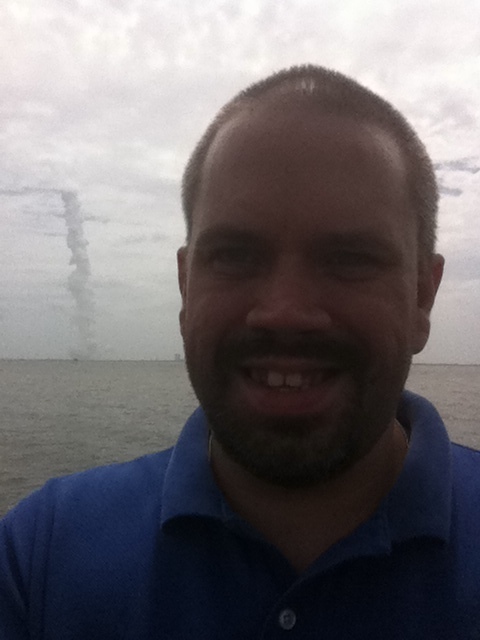 I’ve spent the last nine years of my life writing about it, and I wrote the story on the last launch before I left NASA. I’ve written a book about the shuttle. This was my ninth time driving down to see a launches, and the fifth I’ve seen. I’ve been invested. And I got to be there, got to see it with my own eyes when she flew for the last time. And I’m glad. I can’t believe it’s over. I really have no sense of that yet. I can’t wrap my mind around it. Even just these mundane parts are slow to really dawn — Forget understanding what it means for the program to be over, I’m still working on the fact that my coming down here to watch launches is over. I don’t know when I’ll see the VAB again. I don’t know when I’ll drive down this road again. I’ve been down here at least a dozen times over the last few years. And I have no idea when I’ll be back. It’s weird. OK, long answer to a short question. Sorry.